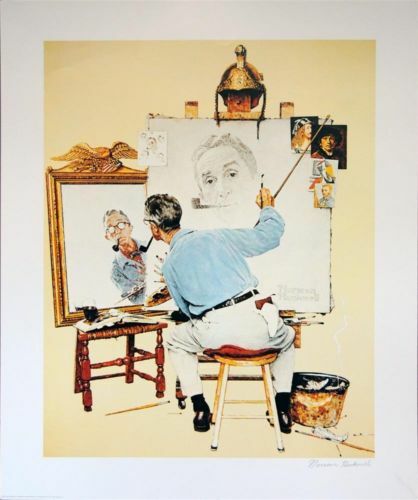 This is a rare Hand Signed Offset Print, by Norman Rockwell, "Triple Self-Portrait"
Norman Rockwell (American, 1894 - 1978). "Triple Self-Portrait". Color offset lithograph. 1960. Printed 1972. Signed in pencil, lower right. Off-white wove paper. The full sheet. Fine impression. Fine condition. Norman Percevel Rockwell was a 20th-century American painter and illustrator. His works enjoy a broad popular appeal in the United States for their reflection of American culture. Rockwell is most famous for the cover illustrations of everyday life scenarios he created for "The Saturday Evening Post" magazine for more than four decades. Image copyright © The Norman Rockwell Estate / ©1960 SEPS: Licensed by Curtis Publishing, Indianapolis, Indiana. Overall size: 30 x 24 in. (762 x 610 mm). Image size: 25 x 19 in. (635 x 483 mm). 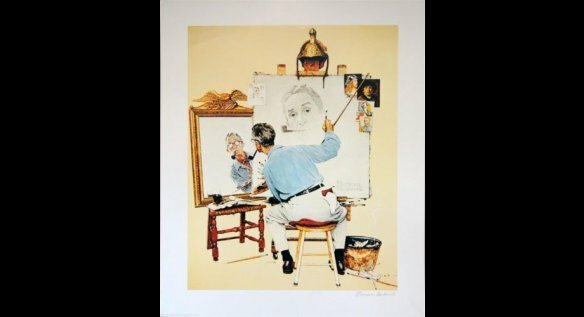 Norman Rockwell (1894 – 1978) is celebrated as "the Dickens of the paintbrush". His warm and often humorous images captured a unique vision of Americana. In addition to story illustrations, advertising campaigns, posters, calendars and books, Rockwell's paintings were showcased on the cover of the Saturday Evening Post for more than forty years. In 1957 the United States Chamber of Commerce cited Rockwell as a Great Living American, saying: "Through the magic of your talent, the folks next door – their gentle sorrows, their modest joys – have enriched our own lives and given us new insight into our countrymen."